Luo Delong, CN-DA deputy director-general, during the orientation meeting held this week. 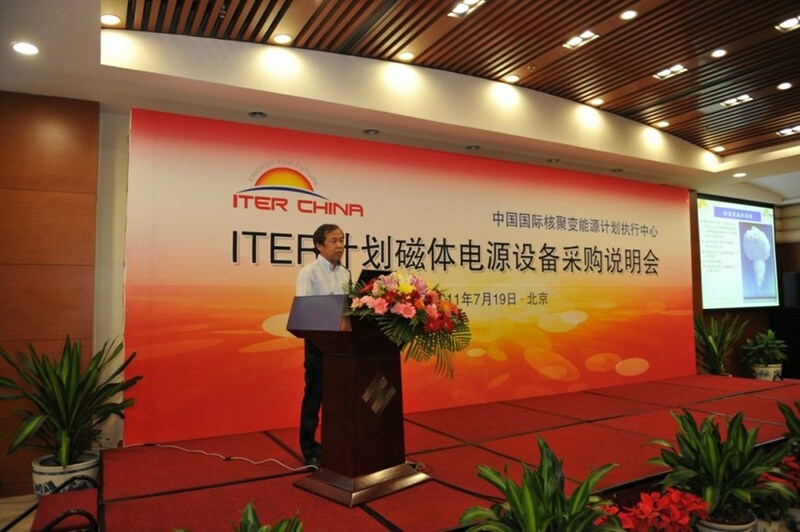 On 19 July 2011, the Chinese Domestic Agency for ITER convened an orientation meeting on the procurement of ITER magnetic power supply equipment. More than 20 domestic power equipment manufacturing companies were present. Luo Delong, Deputy Director-General of the Chinese Domestic Agency (CN-DA), described the overall situation and implementation of ITER. Responsible officers from CN-DA and relevant technical experts spoke on specific items such as the technical requirements of the magnet power system purchasing tasks to be undertaken by China. According to the ITER Organization's general procurement allocation, China will be responsible for manufacturing three procurement packages related to the magnet power supply system, namely the AC/DC converter, reactive power compensation and harmonic filtering, pulsed power network substation equipment, among which the convert system is the most important subsystem of the ITER machine. The meeting was a great success; it not only provided an opportunity for companies to have a better understanding of the ITER Project, but it also demonstrated CN-DA's efforts to create a fair and open environment for the follow-up, call-for-tender and manufacturing phase.